The fabric detail of the French National Jersey is inspired by the story of Nîmes, a town in the south of France. Nîmes was the birthplace of modern denim, and the fabric takes its name from the town (literally ‘de Nîmes’). Nîmes is historically known for its textiles and patterns and the landscape of Nîmes is said to have inspired today’s rugged denim as well as the silk shawls worn throughout Europe in the 18th century. 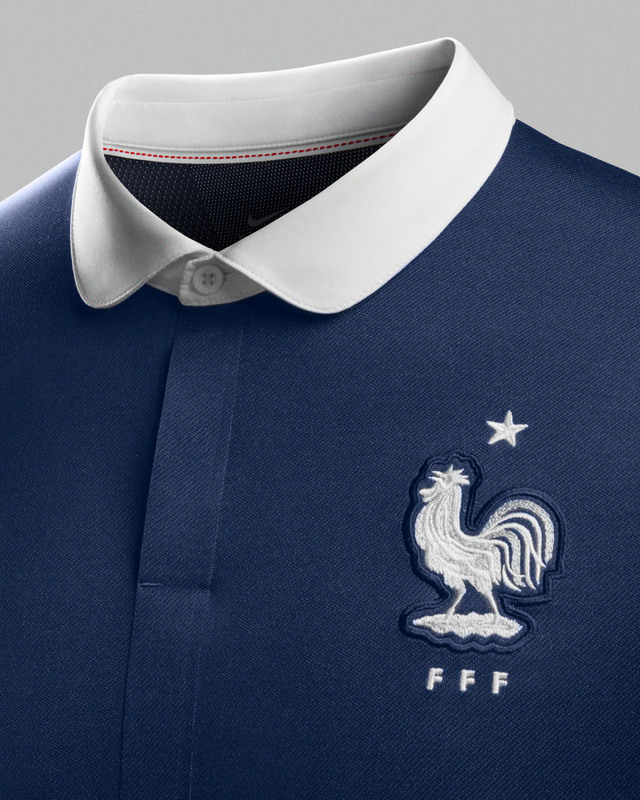 This paradox between raw denim and elegant silk mirrored Nike designers’ desire to create a beautiful design aesthetic for the French home shirt. The crest features a new design inspired by the 1958 crest and reflects players’ feedback of wanting to “feel the history of our country”. The cockerel-design has been enlarged, freed from its badge and given the space to again become the ultimate symbol of French national pride. It's also beautifully embroidered just above the heart and on the bottom of each player’s number, and a flag is placed on the inside of the neck on each kit.